Hello everyone and welcome to this weeks Read With Me. How are we all? So last week was book week and the theme for my girls school was all about poetry and nursery rhymes. Now I do like to read a bit about poetry every so often but trying to dress them up as characters from them proved rather difficult, especially since my 10 year old was desperate to dress up as Clary Fairchild from the Mortal Instruments series. What did your kids end up dressing up as? Another thing that the kids had to do was draw posters up of their favourite poems, I thought it was agreat way for them to go and look up different poems, get them a bit more interested in the subject! Being honest I struggled to remember the poetry which I read when I was at school which is strange because I do remember enjoying learning about them. Now my favourite post last week came from Ups & Downs, Smiles & Frowns, she reviewed the emotionally charged book, Me Before You by Jojo Moyes. This was a book that I would recommend to everyone, I'll admit it had me crying a lot so it isn't all hearts and roses but it was worth the emotional turmoil. Onto this weeks link up, a quick thank you to all who linked up last week. 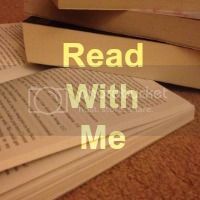 If you are new take a look at the Read With Me page. Regualrs get linking (max of 2 posts), commenting and hopefully displaying my badge. Definitely not cheating! It is all about taking part in the day and shouldn't be about which Mum spent the most hours frantically sewing! My 8 year old loves poetry. Mostly funny poems but it's better than nothing lol Thanks for hosting. Hi Chantelle! Thanks for hosting this link party! Have a great week!